"A joke is never a funny the second time 'round." Through my teenage years I loved the improvisational stand up comedy of Ross Noble, then as he grew up, so did I. Despite this his stand up taught me at a critical age that its okay to think a little differently, and you can still find your way. One of the most intriguing things about Ross is that he would regularly turn down TV work in favour of his live shows. For many years Noble rejected many an acting role as the "wacky neighbour", which would probably have brought him a few years of safe income. How fitting it is that his first major role takes the form of a demented clown out for revenge. 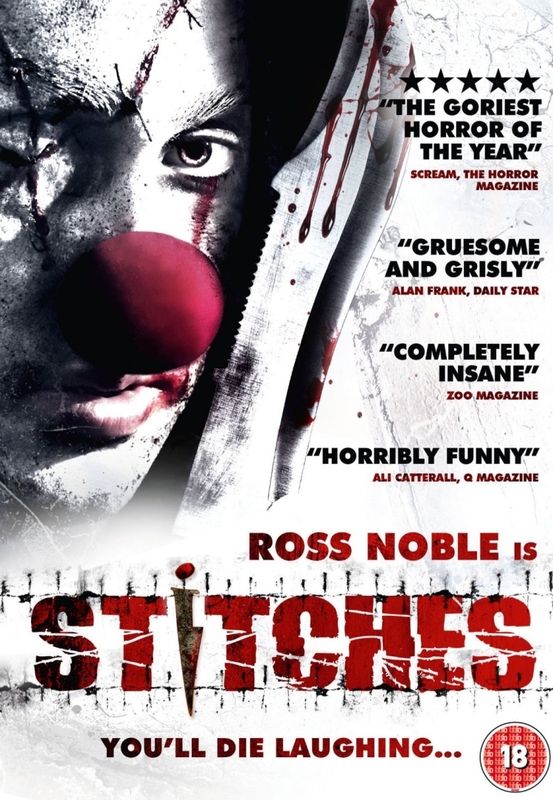 'Stitches' is a down on his luck clown played by Noble, who is accidentally killed by a group of kids who are unappreciative of his act. He trips into the dishwasher and is impaled face first on a knife. Sound the irony alarm. One of the children Tom, whose party it was, suffers for many years with hallucinations and nightmares from the experience, and one day witnesses a bizarre ritual where it is claimed that no clown can ever rest peacefully if he is unable to complete a party. Many years later Tom is now having another birthday party of a more adult sort, which awakens the one eyed clown. If I were to describe Stitches on a technical level, it would be 'crude'. Not quite student film crude, and believe me I've made a few, but definitely low budget. It falls into the same category as The Evil Dead as well made but also cheap looking but don;t get me wrong, theres nothing bad about that at all. I liked that the film doesn't look slick and polished. The mixture of mainly Irish, English and Geordie (Noble alone) accents is slightly jarring to the ear initially but you think about it less as the cast is gradually killed off in increasingly brutal ways. Various American high school movie tropes forced onto an Irish setting and the obligatory Facebook clone "My Face" make the film feel "cheesy', which has become a genre of its own these days. The one that grated on me most was a note reading "Enjoy your present, Mom". Stitches' attacks are all loosely based on the fateful day of his death, and this is emphasised by flashbacks showing how each child disrespected him. My favourite cringey moment is when Stitches kills all nine lives of an obviously artificial cat by flailing it around the room. His outbursts all have an air of humour to them, whether it be a quip from the clown himself or the ridiculousness of the action, like an intestine balloon animal. Read that again, an intestine balloon animal. They were so happy with this creation that its in the films tagline. I didn't care for the films ending sequence, and the foreboding into a sequel seemed a bit over ambitious. There are many story problems here, but what exists is still cohesive, and even lends itself to a series, but I don't see one happening. The problem with such wacky acts is that they lack believability, which ultimately makes the film not very scary but entertaining nonetheless. Stitches is a slasher film for people who don't really like horror, or are being initiated into the genre. It has blood and gore but not too many frights bar the obligatory jump scare. Nobles performance is consistently funny especially when he trying his best to be menacing. His delivery of lines is sometimes cringeworthy, but for his inexperience this is excusable. The role is a thousand miles from his stage persona, while at the same time being appropriate for him given that Nobles brand of comedy more resembles anarchy than a traditional stand up. He truly is an excellent casting. The rest of the cast was alright, not a noticeably bad performance between them and nobody stuck out as irritating or distracting, but as with slasher films the monster is the star. The problem many films like this is often the conclusion. Do you let the monster win, or if not how do you kill it? Stitches comes up with an interesting concept for its showdown that I didn't care for at first, but play itself out well. Stitches is at its best an original work with some unique ideas, and at its worst another slasher. the rest I suppose is up to you.